What could be the best way to get delicious coffee at the touch of a button? It is getting a best Keurig coffee maker. Throughout the years, this popular brand has provided us some of the best products for home and office use. Whether you want to make coffee for yourself every morning, host a small gathering or keep your employees happy, a Keurig coffee maker does the trick for you. They have some of the most elegant and powerful espresso machines on the market. Regardless of the size and style of your kitchen, a Keurig espresso machine will fit in well. You can get piping hot and delicious coffee drinks, tea, and even hot chocolate with these machines. However, with a wide variety of Keurig products available today, it could be difficult for you to find the best fit. We have done an extensive research on 50+ Keurig models available in the market and here are our best Keurig coffee makers for you. If you are looking for a coffee machine that does it all without making any noise, this is the machine you should be opting for. It is one of the most popular Keurig machines as well. The design of the product is amazing, simple and makes it look very elegant. It fits into most kitchens with ease, whether you are using it at home or in office. Now, let’s dive into the features of this amazing coffee maker to know why it is regarded as one of the best in the market. The machine comes with two filters instead of one, so you can enjoy a great cup of coffee for a very long time this is not all. You also get 6 K-cups complimentary from the brand which brings to you an exquisite coffee making experience. Comes with a touchscreen display which helps you in programming your brew however you like. The good thing about the reservoir is that it can be detached. Hence, you can clean it very easily. Though it is slightly bigger than other machines in the same segment, it isn’t very heavy or difficult to move. In fact, it weighs only 13.7 pounds. The reason behind the bigger size is an 80-oz. water reservoir, that helps you in getting at least 10 cups without having to refill the tank. Moreover, it comes in different nightlight colors as well. Therefore, you can choose the one that matches your kitchen style and decor. This coffee maker is great for people who need a cup to start their day as it serves you a perfect regular coffee in less than a minute. The machine can work with a variety of K-cup pods. For instance, you could get a brew size of 4 oz., six oz., 8 oz. and 12 oz. with the machine. If you are looking to host a small gathering or just want to serve bigger mugs for more people, then you can even brew 22 oz., 26 oz. and 30 oz. carafe pods in this machine. Though the K575 is a single serve machine, it works really well as a traditional coffee maker as well. If you get the K575, you will never even have to think twice before serving at a party or even yourself. Just plug in the K-cup pod of the desired size, and you are good to go. It comes with multiple variable functions, temperature control and provides hot water on demand. With its sleek design and modern functions, you get a consistent taste every time you brew. This is the perfect office brewing system. The K145 is ‘THE’ machine that should be used in every office, thanks to its unique design, a great look, and consistent taste with each brew. In fact, this is one of the most important office solutions one would need in the pantry. In this detailed review, we cover the areas where the K145 hits the bulls-eye, where it falters, and who should go for this. Comes with a 48-ounce water reservoir. This helps you in getting more cups in a single fill. You can get as many as 6 regular sized cups made with each fill. The machine’s water reservoir is removable, which makes it easy to clean and fill water. Additionally, the hot water tank can be drained easily. The machine has a removable drip tray. Hence, you will be able to accommodate travel mugs as well. The older models of the machine were not compatible with the K-cups of 20 oz. size. However, the new K145 OfficePro handles variable cup sizes with ease. You can make regular six oz., 8 oz. and 10 oz. cups with this machine. The machine is designed to work flawlessly in busy offices. Therefore, you can get a cup brewed in only one minute. It even has an energy-saving function, which switches off the machine after a few minutes of non-use. The machine’s design and functioning are exceedingly simple. You just need to switch it on, select the settings you want, load in a K-cup of your choice and get started. Complicated machines are good for experienced baristas in cafes. This machine is simple and does its job very well. Moreover, with the K-cups, the employees get to choose the size, strength and even the flavor of coffee they like. They don’t have to rush to a nearby cafe to grab a cup of their favorite flavor. All they will have to do is load a K-cup and switch the machine on. The machine can be slightly noisy, but it isn’t as annoying as most people think. It works perfectly and offers you durability with its heavy-duty pump. You can make iced beverages, hot chocolate and even tea with this machine. Once you have bought this machine, you may not need other beverage makers for years to come. If you are habitual of using programmable coffee machines, you may find this machine to be quite basic due to its lack of the said feature. However, this should not be a problem as the machine works flawlessly in a busy office setup. This is another popular product from Keurig that has stood the test of time and has even become a holiday gift idea. This beautiful single-serve machine gives you a delicious cup of coffee at the touch of a button. It is perfect for single homeowners, students, couples and even for a small office with less than ten people. However, this coffee machine is considered perfect for home use, especially by people who start there day with a cup of espresso. The machine comes with a 48-oz. water reservoir that can serve 6 cups of aromatic and delicious coffee in just one fill. You may have to refill the reservoir every 2 to 3 days, even if you consume 2 cups of coffee at home every day. 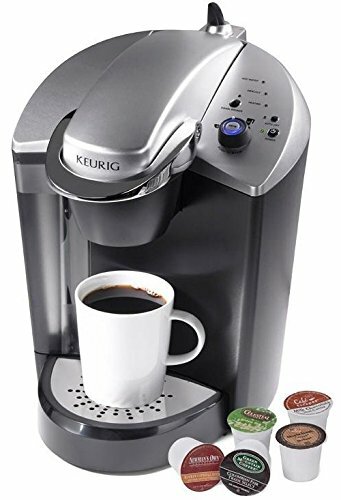 The reservoir of this product, just like other Keurig machines, is removable for easy refilling and cleaning. It comes with an easy step-by-step descaling function that removes calcium buildup and keeps your machine working like new for a very long time. Even if you forget to switch the machine off, it will automatically shut off after 2 hours of non-usage. 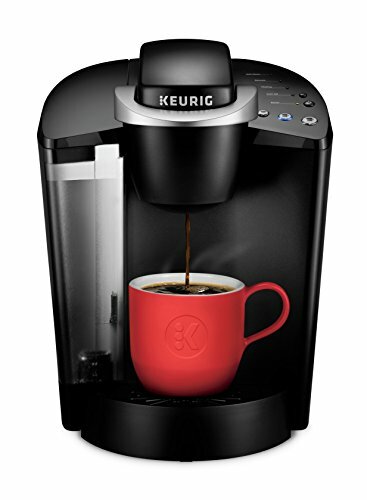 The Keurig K55 K-Classic Single Serve Programmable K-Cup is designed to bring effortless coffee making. Unlike other domestic use coffee machines, it doesn’t come with complicated functions. Just switch the machine on, select a few basic functions and your coffee will be ready in less than a minute. Note that this machine is compatible with a variety of K-cup pods. You can use six oz., 8 oz. and 10 oz. pods with this machine. The good news is that the machine comes with four complimentary K-cups as well. Additionally, it has two water filters as well. 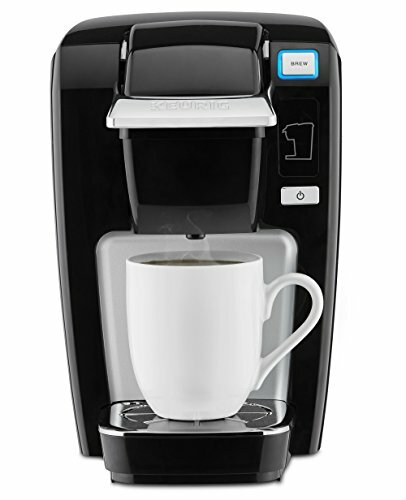 This Keurig model is the very essence of single serve coffee makers. You cannot use this coffee maker to serve a gathering of 6 at a time. However, if you want to serve yourself or a couple of people quickly, then this machine is a perfect fit for you. It simply makes coffee making quick and easy which is another reason why it is popular. The machine is only compatible with K-cup pods. Hence, you can’t use carafe pods here. As the machine offers very simple working, you cannot use advanced functions like water temperature control. The machine, however, offers you great taste and consistency. Therefore, you will have a great time with a delicious brew every morning. One of the best things about this coffee maker is that it is compatible with the My K-cup pods as well. If you are looking for the coolest single serve coffee maker, this is the one you should be buying. 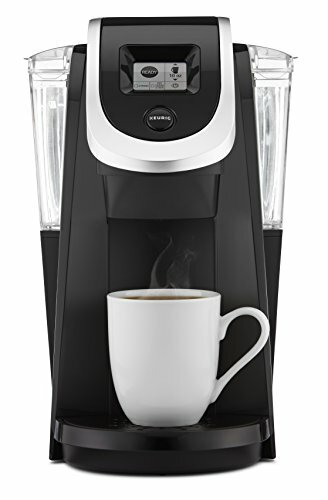 Keurig K250 coffee maker is another popular offering by the brand that combines elegant design with simplicity. It is one of the most aesthetically pleasing offerings from the brand. If you have a kitchen with a contemporary design, you should be getting this product home. If you are using this machine at home and drink coffee only once a day, you may not even have to refill the water reservoir before a week. The coffee maker comes with a 40-ounce water re-service that can help you make 5 to 6 regular sizes coffee cups in just one fill. This reservoir is detachable, which allows you easy refills as well as cleaning functions. The product also comes with an LCD panel. This 2-inch display helps you in setting the functions of the product per your needs, so you only get the coffee you desire. You can get this coffee maker in a variety of bright colors, which helps you in getting a suitable match for your kitchen with ease. Though the machine doesn’t come with many complicated programming functions, it still offers you an amazing coffee making experience. The machine is designed to bring you a delicious cup of coffee at the touch of a button. The machine has some helpful functions like a water level window which helps you in monitoring the water level and checking when the machine needs a refill. Additionally, you can customize the strength of your brew. The machine comes with a removable drip tray which can help you in cleaning it quickly and easily. Regardless of all these functions, the area where the machine really shines is it brew size. Unlike some other popular top-of-the-line products, you get to choose between 4 oz., 6 oz., 8 oz., 10 oz. K-cup sizes, all the K-mug sizes, and even K-carafe size up to 30 oz. Therefore, whether you want to brew a cup for yourself or get great coffee made for a small gathering, you won’t have to brew more than once. The machine can be used effectively in small offices as well. It has been designed for home use, but thanks to its variable brew sizes, it can work under varying circumstances with ease. This is one of the simplest coffee makers you will find on the market. It is designed for people who love their brew but aren’t too finicky about advanced functions. One thing you should note about the K15 coffee maker is that it is extremely compact and portable. It fits into any kitchen. Therefore, even if you are living in a small apartment, you won’t have issues fitting this machine in. The brew size varies from 6 oz. to 10 oz. The machine is fully compatible with all K-cups. You can even choose the brew strength with this one. For lighter brews, opt for 8 oz. or 10 oz. pods. If you are looking for a stronger brew, opt for 6 oz. pods. The machine can let you fill a 5.2 inches tall cup as well. The machine comes with a removable drip tray which helps you in easy cleaning and even accommodates larger cups with ease. It comes with an auto shut off function to save energy. Other coffee makers shut down after 2 hours of non-usage. However, this one shuts off after only 90 seconds. The machine is available in varying colors and can be used to make tea as well as hot chocolate. Moreover, the K-cups help you in getting a variety of coffee flavors. If you are looking for a very personal coffee maker, this is the product you should be buying. Just like other Keurig products, the functioning of this product is very simple. Just load the K-cup of your choice, fill the water reservoir, and switch it on. You will get delicious coffee made for you in under a minute. You don’t even have to worry about the heat retention abilities or milk steaming capabilities of the machine as the K-cup pods provide you the tastiest and most savory coffee making experience ever. Keurig is one of the leading coffee machine manufacturing brands in the US. It has become a household name because it provides you with a wide range of home and office use machines. Keurig presents to you some of the best single serve coffee makers on the market. All the machines are compatible with K-cup pods from the brand. These pods can be loaded on the machine to create amazing coffee quickly and easily. These pods are available in a variety of sizes as well as flavors, which gives you more flexibility of use. Another good thing about these Keurig machines is that they are very simple in design and aesthetics. They can fit into any kitchen, regardless of the décor and the size. The first thing that you must consider before buying a Keurig machine is its use. 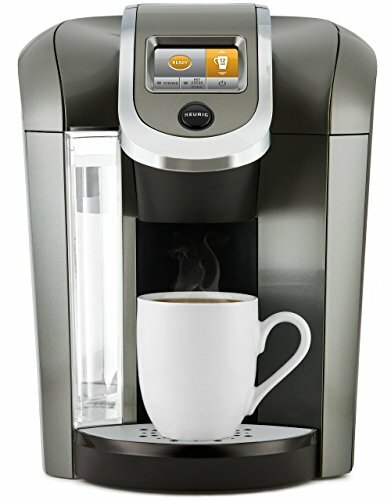 Keurig’s machines are not only for domestic use but also for office use. The office use machines are designed for quick coffee and heavy-duty use. However, the domestic machines are mostly simple; single-serve machines. The use of the machine will also decide the kind of functions you should be looking for. If you simply want a quick cup of coffee, go for the most basic models. If you like more strength control, a model like K575 will be a better option for you. If you don’t want any advanced functions on your machine and simply want something that gives you a coffee cup at the touch of a button, opt for a very personal coffee maker like the K15. However, if you are willing to go for more strength control, you should opt for the K55 model. Any model of the Keurig Plus Series will get you strength control. The compact single server is always better for people who don’t mind filling the water reservoir with fresh water. However, if you don’t want to bear this hassle, you should go for K55, K250 or the K575. Keurig offers you some of the best sub-$100 compact single-serve machines on the market. A coffee maker which works with a variety of K-cup pods is usually available for less than a hundred dollars. You could even get these machines for a good discount if you are buying them online, on platforms like Amazon. If the machine isn’t brewing properly, you must first think about cleaning it properly. A machine that hasn’t been cleaned properly for a while will usually stop working properly. So, clean the machine and descale it before you use it again. This should solve your brewing problems with ease. You should descale the machine every six months. However, if the water in your area is harder, you should do this exercise every three months. If the machine is still not working, clean the filter of the machine once again and then switch it on. Your machine should work like before. Many Keurig coffee makers come with auto shut off functionalities. Many Keurig coffee makers come with auto shut off functions. Your coffee machine can shut off after 90 seconds of non-use. So, if your machine has shut down automatically, you might want to switch it on automatically. However, if the machine isn’t having a problem with auto shut off and is switching on/off at random, then you might want to talk to the manufacturer. Simply call the manufacturer, and they will help you fix the machine or replace it with a new one. This is a common problem with the Keurig machines. However, there is nothing to worry about. It is highly likely that your reservoir isn’t filled properly. Simply fill more water in the reservoir, and your machine should start working well again. If the problem persists, you should give your machine a thorough cleanse. This is also a good way to get the machine working again. If your machine hasn’t been descaled in a while, then you should get it descaled immediately. Sometimes, calcium buildup in the machine could be responsible for such a message. In general, just filling the water reservoir till full or giving it a thorough wash before a fill does the trick for you. If none of these methods work for you, simply call the customer helpline number and follow their instructions. Keurig is a leading name in the coffee maker category, thanks to their amazing single-serve machines. They also bring to you K-cups in varying sizes, strengths, and flavors. Most other coffee makers come with complicated functions. However, the best Keurig coffee maker tries to bring simplicity to their designs. Once you get the K-cup of your choice, you will simply have to load it into the machine to get the coffee of your choice. The coffee makers boast of great consistency in their brews, and the coffee pods help in bringing a delicious and rich coffee experience your way.